The Amalfi Coast has for centuries been one of the most popular parts of Italy for visitors from Europe and beyond. Originally a series of simple fishing villages which clung precariously to the steep hillsides which run from Sorrento to Salerno, they were joined together by the creation of a narrow winding road in the 19th century. Today, this collection of stunning villages includes names to conjure with, like Amalfi, Positano, Praiano, and of course Ravello. Many artists, writers and celebrities have chosen to make their homes on the Amalfi coast, and it is a very popular destination during the summer season from May to October. Only a short drive away from Naples airport, the Amalfi coast and its towns make a wonderful place to visit for a week or two. After a couple of days in the largest town in the Amalfi Coast, the beautiful Sorrento (reviewed here), we made our way along the coastal road until we reached Ravello, the last of the Amalfi towns. The Belmond Hotel Caruso in Ravello is a former palace dating back to the 11th century, although most of the current building dates to the 18th century. Set in a commanding position on cliffs overlooking the Mediterranean Sea, it was purchased by the Belmond luxury hotel group in 2000, and is today part of the much-coveted Leading Hotels of the World Collection. Hotel Caruso underwent years of restoration before re-opening in 2005 with 50 rooms, each one unique in its features and layout. The building's ancient walls and fresco-covered ceilings have been preserved, making it a remarkably beautiful and historic venue. Strolling through the extensive terraced gardens overlooking the sea, or lounging beside the stunning infinity pool, rank among the most breathtaking moments we enjoyed during our trip on the Amalfi Coast. Our suite was one of the most spacious I have ever stayed in, and set over three levels amidst the terraced herb and flower gardens overlooking the sea. The foundations of this suite were discovered beneath the terraces around the old hotel in 2000, and date back to Roman times. The suite had a wisteria-covered veranda with stunning sea views, and was elegantly furnished with tasteful Roman-style artwork blending in with state of the art facilities, including the Belmond signature TV which, at the touch of a button, popped up from a wooden cabinet at the foot of the bed. The bathroom was vast and set out over three levels, with a separate shower, three sinks and a large jacuzzi with its own TV, with all the toiletries supplied being by Bulgari and Penhaligon’s. The really fine details like the turn down room service each evening made our stay at Hotel Caruso very special. We were delighted to find an array of chocolates and freshly baked pastries at night as we returned to our room. In fact, the wonderful smell of freshly baked pastries pervaded the hotel each afternoon in preparation for this service. Breakfast was served in the dining room, either inside or on the terrace, depending on the weather. There was a wonderful buffet of fresh fruit, cereals, cheese, hams, salami, and cakes and bread baked in house. Campania is home to some of the best mozzarella in Italy as well as the sweetest tomatoes the land can offer, and shamelessly, I had platefuls of both during our stay there. 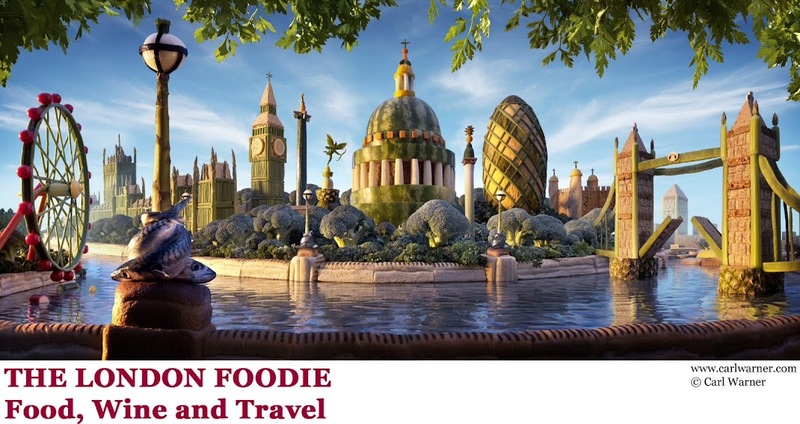 There was a particular emphasis on local produce – especially cheeses and pastries. A variety of freshly cooked items were available to order, including Caruso Eggs - poached, then grilled under a slice of mozarella, and served on a fine layer of toast. While taking breakfast, the eyes feast on the spectacular views of Ravello and the Amalfi coast below. Ravello is one of the most ravishing towns of the Amalfi Coast, and in my experience, there have been few hotels that exude such a sense of place and history as the Belmond Hotel Caruso. If you are planning a visit to Ravello, I would highly recommend it. After a morning on the hotel's yacht viewing the villages from Amalfi to Positano, we returned hungry to the hotel. The poolside restaurant beckoned, and we went there for a light lunch before taking a dip in the infinity pool. We started with a Caruso Spritz – the hotel’s adaptation of an Italian classic, given an ‘Amalfitana’ twist – this had one part each of sweet Limoncello and bitter Campari to three parts of Aperol, topped up with Prosecco and soda water. While deciding what to order, we had some delicious pastry canapés with tomato salsa and Parmesan cheese. The sous-chef Salvatore de Luca explained that their pizza dough is left to prove for 48 hours with very little yeast, and this helped to make the base light and easy to digest. Taking heed, we ordered a seafood pizza, served with fresh lobster, mussels, clams, prawns, squid, parsley and olive oil, which was indeed magnificent. Our 2nd choice, Pizza Caruso had tomato, mozzarella bocconcini, capers, anchovies and black olives. Much simpler in conception, this was also excellent with a light and well-textured base, and toppings of very high quality. We enjoyed a bottle of a local beer 'Birra', brewed in the nearby town of Tramonti with spelt and orange zest, which had a deliciously rich and aromatic flavour. In Italy, pizza is generally enjoyed with beer, not wine. We finished with a Café Machiatto, some squares of chocolate and lemon cake, and a glass of extremely chilled Limoncello from Ravello. Writing this, and looking back at all the pizze I have consumed during my many trips to Italy, I daresay that Hotel Caruso’s pizze are probably the best I have ever eaten. The dough was so light yet had such wonderful texture, and their toppings were of the best quality. The pizze at Hotel Caruso warrant a visit to this poolside restaurant in their own right. I was fortunate to find time in Head Chef Mimmo di Raffaele's diary, to chat with him about Italian cuisine and the food he serves at his restaurant. Mimmo (short for Domenico) is originally from Casserta, near Naples. He trained in Switzerland and France, and then worked in Milan and Rome before settling at the Hotel Caruso in 2007. He has had some interesting assignments along the way, including being summoned to the Imperial Palace in Tokyo to cook for the President of Italy and the Emperor of Japan in 2010. Arising from his time in Japan, he loves to serve what his mama calls 'Susho' - sushi made from Italian ingredients. 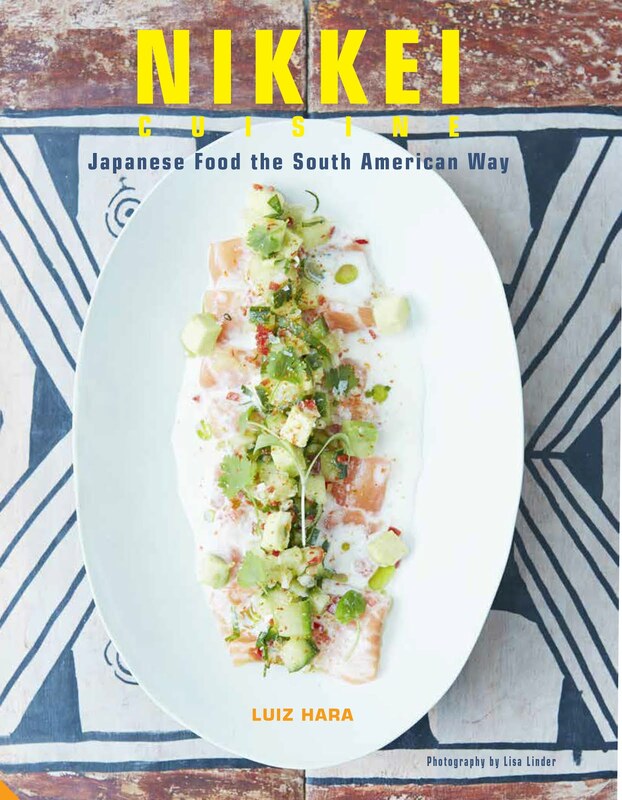 Despite his love of Japanese food, at the hotel he likes using the produce of his beloved Campania, in particular the lemons, anchovies and mozzarella, for which the region is famous throughout Italy. Pre-dinner drinks and ‘aperitivi’ are a serious matter in Italy, but Hotel Caruso’s exceeded expectations - we had a selection of local appetizers including sfogliata (the most popular of Naple’s delicacies, this is a many-layered pastry), butterflied prawns fried in maize flour, ricotta cheese from Tramonti with marinated anchovies from Cittara and tomato confit, as well as fried anchovies with a purée of tomatoes from San Marzano. Moving on to the main affair i.e. dinner, we put our wine choices in the hands of sommelier Alfonso Somma, with the sole instruction being that we wanted to taste exclusively wines of the local Campania region. We kicked off with a Frisella di Agerola - bread with endive cream, tomato, capers, olives and raw amberjack fish. This was a refreshing dish with contrasting textures, and Chef Mimmo’s Japanese twist made for an elegant sashimi-come-panzanella creation. 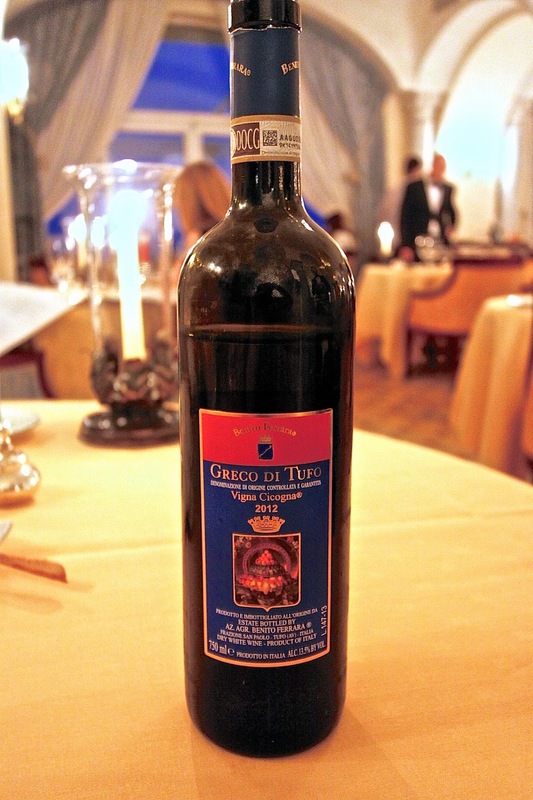 To accompany, we had a glass of Greco di Tufo DOCG 2012. From Tufo, a small village in Avelino, this was golden in colour, with fresh lemon flavours, crisp acidity and minerality. The next dish was 'Spring Time in the Garden'. Almost too beautiful to be eaten, this was an assortment of locally grown vegetables and fish including turnip tops, cicerchie beans, herb sprouts, carrots, an artichoke mousse and anchovies. Elegantly presented, the vegetables were at their peak of freshness and flavour, served in simple dressing of light olive oil and balsamic vinegar. 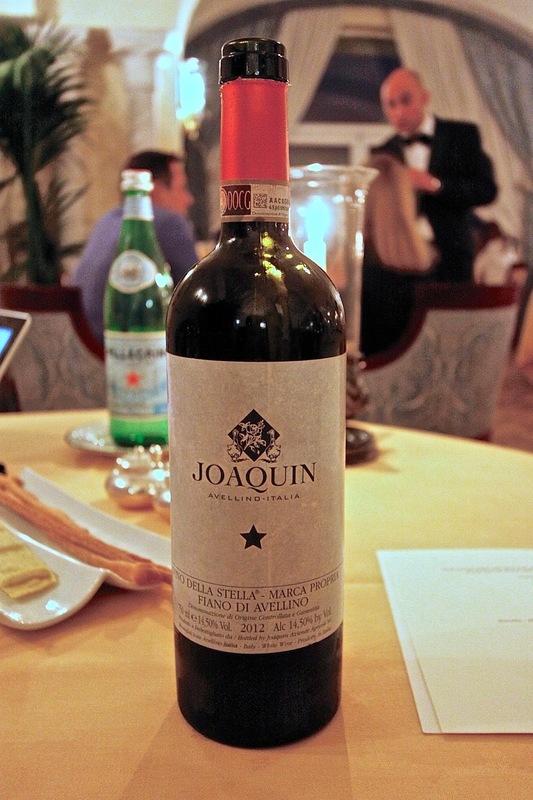 To accompany it, we had a glass of Fiano d'Avelino DOCG 2012, from Joaquin, Della Stella. There are only two wine regions in Campania that reach the DOCG appelation - Fiano d'Avelino and Greco di Tufo. This Fiano was a very fine example, with tropical notes of pineapple and mango, with minerality and balancing acidity. The Fiano grape is considered to be the best grape of Campania, being a half-aromatic (like Sauvignon Blanc, in contrast to fully aromatic wines like Gewürztraminer). To follow, we had cream of artichoke with Parmesan fritters, bread croutons with shrimps and a tartare of langoustine. The croutons were crunchy and each had a tiny raw shrimp on top. The raw langoustine had been formed into a little quenelle, perched on top of a tiny baby artichoke heart. The Parmesan fritter was a tasty little ball of flavour, savoury and delicious – a medley of flavours and textures, this was another excellent dish. 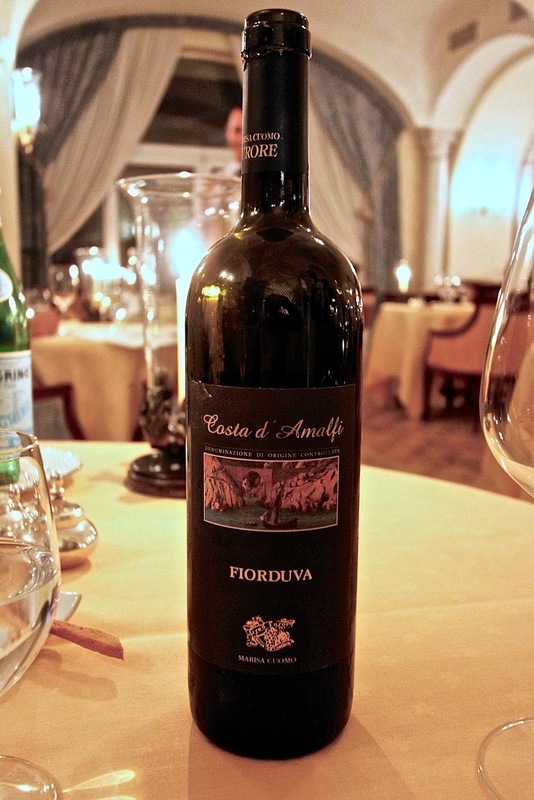 With this, we drank a glass of Costa d'Amalfi, Fiordu DOC, from the town of Furore, just 20 minutes from Ravello. The vines from the Amalfi Coast were never affected by the phylloxera pest that destroyed much of Europe's vineyards in the 20th century, and so many vines are over 100 years old. For this wine, the grapes (Ripoli, Fenile and Ginstra) were dried on straw for one week, and then matured in new French oak. The result was a golden, rich, powerful wine of great complexity, with crisp acidity, apricot flavours and a long finish. Our next course was spaghettoni with Venus clams and black truffles – the ingredients in this pasta speak for themselves. Heaven. For main course, we had suckling pig with apple sauce, spinach and langoustine. This dish featured the famous black pig from Casserta (chef Mimmo’s home town), cooked for 18 hours at 60 degrees. The resulting suckling pork was sensationally delicious, crisp on the outside, very soft and unctuous from the melted fat inside. I loved the marriage of top quality pork and seafood as well as the stunning presentation of this dish. Top marks. Suckling pig can go well with white or red wine, but the sommelier selected an excellent red Montecorvo DOC Costa d'Amalfi. This is a natural wine made from Aglianico, Piedi Rosso and Tintore grapes. It was medium bodied to match the weight of the suckling pig, with ripe cherry and vanilla flavours, and high acidity counterbalancing the richness of the pork. 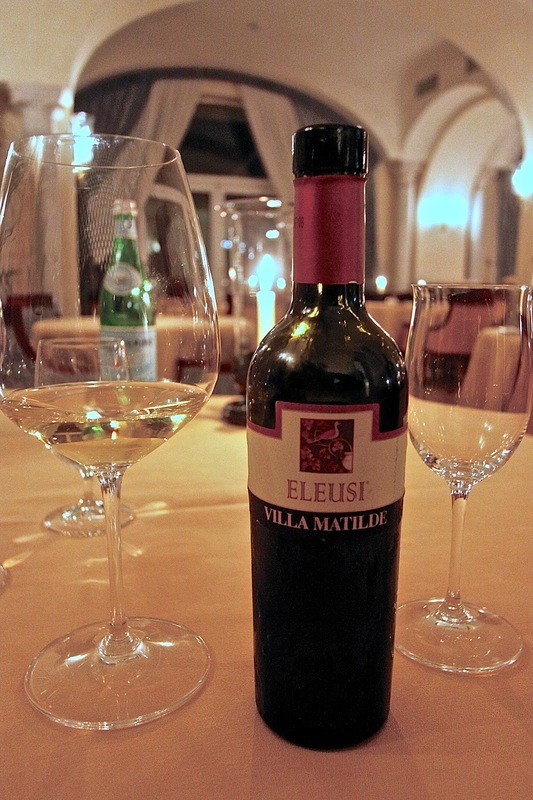 In preparation for dessert, we were offered a sweet wine - an Eleusi Passito 2006 from the Villa Matilda winery in Roccomonfina (a coastal village near Casserto in Campania). The combination of volcanic soil, sea air and large temperature variation from day to night gives the perfect conditions for the development of complex flavours in the Falanghina grapes that are partially dried in the making of this dessert wine. The first dessert served was 'Strawberry Emphasys' - strawberry parfait, a 'Basmati' rice cream, and a wild alpine strawberry salad scented with ginger, yoghurt and basil ice cream. This was a beautifully presented dessert but it was the unusual combination of basil and strawberry that was a real revelation for me. Our second dessert was equally striking - a chocolate sponge case, with dark chocolate mixed with fried aubergine purée, ricotta ice cream and candied lemon. The combination of aubergine and chocolate was created in the small village of Minori on the Amalfi Coast, where slices of fried aubergine are smothered with chocolate and served rather like a sweet ‘melanzane alla Parmigiana’ with chocolate instead of cheese and tomatoes. I loved this sophisticated version created by Chef Mimmo. 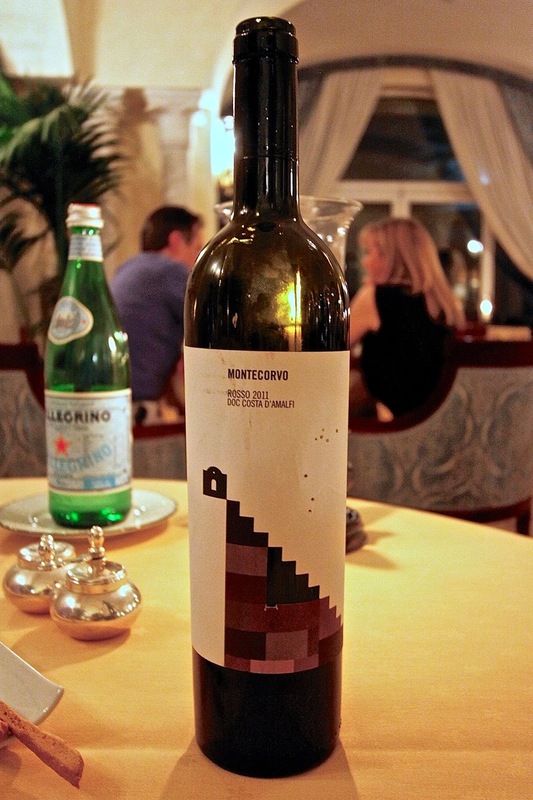 Our meal at The Belvedere Restaurant was one of the highlights of this trip to Italy. Chef Mimmo di Raffaele’s cooking reflects a passion for the produce of his native Campania and extensive knowledge of other cuisines through his travels. I highly recommend a visit before the Michelin stars start raining down and prices become inaccessible. The Hotel offers a fantastic complimentary yacht excursion that runs each morning along the Amalfi Coast to Positano, with guides speaking very good English. It is breathtaking to see the villages from the perspective of the sea. Being in the heart of the Amalfi coast, it is quick and easy to take a complimentary shuttle bus for a stroll in nearby Amalfi. And just a little further afield, around 90 minutes' drive, lies Roman Pompeii. The village of Ravello has a picturesque small piazza, from which streets with boutiques and artisan shops meander, and can be visited in an hour or two. What better to do after this than to relax by the Infinity Pool at the Hotel Caruso? Set at the highest point above the town of Ravello, the hotel's infinity pool is breathtaking, with stunning views over the Amalfi coast. The pool is heated, and there is the Belvedere poolside restaurant offering some of the best pizze in Italy. After all that pizza, you might like to work out at the hotel’s fully equipped air-conditioned gym, with a range of range of cardio equipment and weight machines, all positioned in front of windows with a panoramic view of the coastline. The hotel also has a qualified personal trainer. Naples is around 90 minutes from Ravello by car, and is just a few miles beyond Pompeii, so at a push the two could be combined in a single day. We did not have long, but called in on Naples to have lunch in the home of pizza on our way to the airport. Brandi is a pizza restaurant near Piazza Plebicito in Napoli, which came highly recommended by a number of Italians we spoke to. It has been in existence since the 19th century, and claims to have invented the Margarita pizza, for Queen Margarita on one of her visits to the city. A selection of pizze was presented, and her favourite was named in honour of her - it combined the three colours of the Italian flag - red tomato, white mozzarella and green basil. We had a Don Vincenzo (€9), with tomato, Fior di latte cheese, anchovies, capers and olives. This was ok, but did not come even close to the standard of the pizza at Hotel Caruso. Our other choice was a Don Raffaele, (€10), with Fior di latte cheese, Parmesan, Provolone, Gorgonzola and basil. The cheeses were delicious, but sadly the dough was a tad undercooked. These were washed down with a half bottle of Greco di Tufo 2013, Terredora, for €8. Flights are available from London to Naples with British Airways or Easyjet, and it is then a 90 minute car journey to arrive in Ravello. Rooms cost from €455 to €2,500 per night, although there are discounts of up to 33% if staying 3 or more nights. Like most hotels, shops and restaurants in Ravello, the hotel closes from November to March each year.